Spain national football team celebrating its victory at the UEFA Euro 2008 Championship in Madrid. Sport in Spain in the second half of the 20th century has always been dominated by football. Other popular sport activities include basketball, tennis, cycling, handball, motorcycling, Formula One, water sports, rhythmic gymnastics, golf, bullfighting and skiing. Spain has also hosted a number of international events such as the 1992 Summer Olympics in Barcelona and the 1982 FIFA World Cup. With Rafael Nadal's Wimbledon championships in 2008 and 2010, the tennis team winning the Davis Cup five times (2000, 2005, 2008, 2009 and 2011), basketball team winning the 2006 World Basketball Championship, the 2009 EuroBasket, and the 2011 EuroBasket, Fernando Alonso's back-to-back (2005 and 2006 Formula One championships), the football team bringing home Euro 2008, the 2010 World Cup and Euro 2012 trophies and Óscar Pereiro, Alberto Contador and Carlos Sastre's 2006, 2007, 2008 and 2009 triumphs in Tour de France more recently, several papers have looked beyond Sastre's win to claim that Spain is enjoying something of a sporting "Golden Age"-similar to the Spanish 17th century achievements in painting and literature). Soccer is the most popular sport in Spain. La Liga or Primera División (The Spanish League) is considered to be one of the world's best competitions. Successful teams in recent European competitions are Real Madrid, FC Barcelona, Sevilla, Athletic Bilbao, Valencia and Atlético Madrid. Real Madrid and Barcelona have dominated with for much of its history, and created an intimate rivalry. Real Madrid has been dubbed by many pundits as the most successful club in the world, having won the UEFA Champions League a record 11 times, almost all other UEFA club competitions at least once and the La Liga a record 32 times. This said, as of 2009, FC Barcelona is both champion of La Liga and the UEFA Champions League's victor. Also FC Barcelona has won the "Copa del Rey" championship. Other teams such as Atlético Madrid, Sevilla and Valencia have also gained prominence by winning the UEFA Cup in 2009, 2006–2007 and 2012 , and 2004 respectively. The Spanish national football team has been successful and have qualified for the FIFA World Cup tournament thirteen times since 1930. In 2010, Spain defeated the Netherlands in the final to win the tournament for the first time. In the European Championship they were champions in 1964, 2008 and 2012 and runners-up in 1984. Spain has won two medals in football Olympic Games tournaments. They have won a silver medal at the Sydney 2000 Olympic Games, and won a gold medal during the 1992 Barcelona Olympics. The youth teams have also been quite successful in the last decade. The U-20 team won the FIFA World Youth Championship in 1999 and were runners-up in 1985 and 2003. The U-17 team was runners-up three times and won third place in 1997 in the FIFA U-17 World Cup. The Spanish ACB is one of the major European basketball leagues. Spanish teams such as Real Madrid Baloncesto, FC Barcelona Bàsquet and Joventut Badalona have won international championships such as the Euroleague or Eurocup. A number of Spanish players such as Pau Gasol and his younger brother Marc Gasol, José Calderón, Ricky Rubio, and naturalized Spaniard Serge Ibaka are currently playing in the NBA. Other Spanish players who have recently played in the league include Rudy Fernández and Sergio Rodríguez. 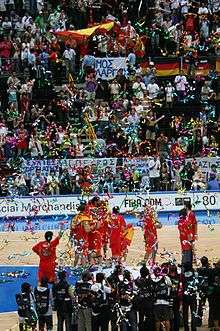 The Spanish men's national basketball team has achieved a high ranked position in the international tournament by winning their first ever gold medal at the 2006 FIBA World Championship, and have won six silver medals and three gold medals at the EuroBasket. Most recently, they won the gold medal at EuroBasket 2011, a silver at the 2012 Summer Olympics and a gold at EuroBasket 2015. The women's national team were silver medalists at the 2014 FIBA World Championship for Women. Spain has produced a number of tennis champions, excelling in tournaments held on clay courts such as the Roland Garros tournament. Rafael Nadal is considered the greatest Spanish tennis player of all time. He has won the French Open for five consecutive times, and altogether won nine Roland Garros titles surpassing Björn Borg's record of six French Open titles. After defeating then world number #1 Roger Federer, Nadal claimed the Wimbledon trophy and became only the second Spaniard to do so. He also won the 2009 Australian Open, the first male Spaniard to do so. In 2009, he became the first player ever to simultaneously hold Grand Slam titles on clay, grass, and hardcourt. In addition, Nadal is the Gold Medalist at 2008 Summer Olympics in Beijing, China. As of now he has won 14 grand slam trophies; constituting nine French Open titles, two Wimbledon titles, two US Open title and one Australian Open title. Spain has produced several other world number one players such as Arantxa Sánchez Vicario in 1995 (also a 3 times French Open champion in 1989, 1994 and 1998 and 1994 US Open Champion), Carlos Moyá in 1999 (1998 French Open champion) and Juan Carlos Ferrero in 2003 (2003 French Open Champion). Other Grand Slam champions include Manuel Santana (1961,1964 French Opens, 1966 Wimbledon and 1965 US Open), Sergi Bruguera (1993–94 French Opens), Andrés Gimeno (1972 French Open), Conchita Martínez (1994 Wimbledon), Albert Costa (2002 French Open) and Garbiñe Muguruza (2016 French Open). Other notable top 10 players from Spain include #2 Àlex Corretja, #3 David Ferrer, #5 Tommy Robredo, #7 Juan Aguilera, #7 Emilio Sánchez (older brother of Arantxa Sánchez Vicario), #7 Alberto Berasategui, #7 Fernando Verdasco, #10 Carlos Costa, #10 Félix Mantilla, Lilí Álvarez or Manuel Alonso. Tournaments held in Spain on the men's tour every year include Madrid, Barcelona, and Valencia, Spain. The women have events in Madrid, Barcelona, and Marbella. The Spanish Liga ASOBAL is one of the best club competitions. A number of Spanish teams such as BM Ciudad Real, FC Barcelona Handbol, and Portland San Antonio have won or were finalists in the EHF Champions League. Since the 1990s the men's national team has won eight medals in top class international tournaments, with three bronze medals at the Olympics, three second and a third place at the European Championships and two World Championships (2005 and 2013). Spain has hosted four Grand Prix motorcycle racing events. They include the Catalan motorcycle Grand Prix, the Spanish Grand Prix, the Aragon motorcycle Grand Prix, and the Valencian Community motorcycle Grand Prix. Most events have received high attendance numbers. Notable Spanish grand prix motorcycling riders include Dani Pedrosa, Nicolás Terol, Jorge Lorenzo, Marc Márquez, Álvaro Bautista and Emilio Alzamora, the third of the listed being a two-time MotoGP champion, having won the title in 2010 and 2012. Notable retired racers include Àlex Crivillé, Jorge Martínez Aspar, Sete Gibernau, Sito Pons, and Ángel Nieto. Away from the track, Laia Sanz has won multiple women's world titles in motorcycle trials and enduro as well as several wins in the female class of the Dakar Rally. In Formula One the two world championships of Fernando Alonso, in 2005 and 2006, have made the sport popular in Spain. It was, until 2012, the only country to host two Grands Prix, the Spanish Grand Prix in Barcelona and the European Grand Prix on the Valencia Street Circuit, which was discontinued for 2013. In the World Rally Championship Spanish rally driver Carlos Sainz was crowned world champion in 1990 and 1992 and is ranked third with most wins with 26. Sainz retired from WRC in 2005 and switched to rally raid, where he won the 2010 Dakar Rally. Daniel Sordo has achieved best results since then by finishing third in the World Rally Championship in 2008 and 2009. In endurance racing, Fermín Vélez is two-time 12 Hours of Sebring winner and two-time World Sportscar Championship Group C2 champion, Marc Gené won the 2009 24 Hours of Le Mans and 2010 12 Hours of Sebring, and Antonio García won the 2009 24 Hours of Daytona. Cycling has been an important sport in Spain since the 1940s. 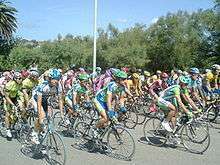 The Vuelta a España (Spanish for "Tour of Spain") is one of the most important cycling events in the world, together with the Tour de France (French for "Tour of France") and Giro d'Italia (Italian for "Tour of Italy") stage races, collectively known as the Grand Tours. Several Spanish cycling athletes have won the Tour de France, including Federico Bahamontes, Luis Ocaña, Pedro Delgado, Óscar Pereiro, Alberto Contador, and Carlos Sastre. The most successful Spanish cyclist is Miguel Indurain. He won the Tour de France in five consecutive years between 1991 and 1995. He also won the Giro d'Italia in two consecutive years (1992 and 1993), the 1995 Road World Championship time trial and the gold medal in the 1996 Olympic time trial. More recently, in 2008, Sastre became the seventh and third consecutive Spaniard to win the Tour de France, then followed by Contador winning his second tour in 2009's edition. Contador was thought to have repeated his win in 2010, but the day before Stage 17, the queen stage finishing with atop the Col du Tourmalet, Contador tested positive for performance-enhancing substance Clenbuterol. Although he claimed it was a result of consuming contaminated beef, in January 2012 the Court of Arbitration for Sport ruled him guilty and gave him a two-year ban backdated from July 21, 2010, and had all his results achieved after July 21 erased, including victory in the 2010 Giro d'Italia and a 5th-place finish and most aggressive rider award for stage 19 at the 2011 Tour de France. Since returning from the ban, Contador has won the Vuelta twice, in 2012 and 2014. Óscar Freire shares the distinction of being one of four men to win the World Road Racing Championship three times, as well as being a three-time winner of one of the most prestigious one-day classic cycle races, the Milan–San Remo. Abraham Olano won the Vuelta a España in 1998, and is the only man to win World Championships in both the road race (1995) and time trial (1998). Spain has also produced some notable mountain bikers llke José Antonio Hermida and track racers like Olympic medalists Joan Llaneras, José Manuel Moreno Periñán, José Antonio Escuredo or Sergi Escobar as well as multi-world champion Guillermo Timoner. Golf has become popular among the Spanish. There are a number of courses located in different parts of Spain. 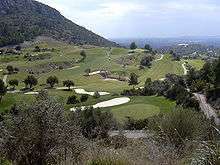 They include the San Roque, Sotogrande, Valderrama, and Alcaidesa. 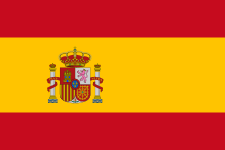 Spain hosted the 1997 Ryder Cup. Spanish golfer Seve Ballesteros won the U.S. Masters Tournament twice, and the British Open three times. José María Olazábal has won two Masters titles. Sergio García spent much of his career in the top 10 of the Official World Golf Rankings (over 250 weeks between 2000 and 2008). In the women's game, Spain fielded the winning team in the inaugural International Crown in 2014. The Spain men's national water polo team is no stranger to the world's elite of this sport. The 1990s were a particularly successful decade for the Spanish team. Major achievements included a Silver medal at the 1992 Olympics and its greatest performance to date, winning the Gold medal at the 1996 Olympics. Other remarkable performances include winning the Gold medal at the 1998 World Aquatics Championships and, again, at the 2001 edition. They also took Silver at the 2009 FINA World Championships in Rome. Before that, Spain had taken Silver at the 1991 edition and then again at the 1994 World Aquatics Championships. During the 2000s, Spanish swimmer Gemma Mengual has heralded a series of both individual and team medals for Spain in all the major international synchronized swimming tournaments, including the Silver medal at the Beijing 2008 Olympics. Mengual's coach, Ana Tarrés, who herself represented Spain in the sport at the 1984 Summer Olympics, also served as coach of the national team from 1997 to 2012: during her time in charge the team enjoyed great success, taking four Olympic medals, 26 World Championship medals, and 25 European Championship medals. Other Spanish synchronised swimmers to enjoy success in international competition since the emergence of Mengual include Paola Tirados, Andrea Fuentes, the most decorated swimmer in the history of the Spanish national team, Ona Carbonell and Margalida Crespí. Rhythmic gymnastics is a popular sport through all Spain, so far the most successful individual rhythmic gymnasts are Carolina Pascual who won a silver medal in the individual all around competition in Barcelona 1992, Carmen Acedo who won gold medal in clubs competition in World Championships in 1993 and Almudena Cid this last is the only rhythmic gymnast who has competed at four olympic finals, placing 9th at Atlanta 1996 and Sydney 2000 being 8th at Athens 2004 and Beijing 2008. In the Atlanta 1996 the Spanish team won the first gold medal of the new competition by groups. The Spanish team was formed by Estela Giménez, Marta Baldó, Nuria Cabanillas, Lorena Guréndez, Estíbaliz Martínez and Tania Lamarca. Spain has found more success in the group competition than at the individual one, the country won many medals and gained prominence in the 90's which has its peak at the Centennial Olympic Games in Atlanta 1996, after the world championships at home in Seville 1998 the group went downhill and had inconsistent results until 2012 when they finished at the 4th place at the Olympic Games in 2012 London Olympics and a performance they would repeat at the 2013 World Championships in Kiev where the Spanish group won the gold at the 10 clubs final and a bronze in the 3 balls + 2 ribbons final, their firsts world championships medals in 15 years, at the 2014 World Championships in Izmir , Turkey they retained their world title in the 10 clubs final. In 2015 at the XXXIV World Rhytmic Gymnastics Championships held in Stuttgart, Germany the group won the bronze medall at the all around competition, since 1998 the Spanish group hasn't won an all around medal. Roller hockey (Quad) is played by professional athletes. The Spanish national has won the World Championship 14 times with 12 second places and 7 third places and also won the European Championship 14 times with 15 second places and 5 third places. The Spanish teams as FC Barcelona, Reus Deportiu, Igualada HC and HC Liceo La Coruña has won the European Clubs Cup in 39 editions, losing only in 5. Basque pelota and Valencian pilota are traditional Spanish sports. Tournaments includes trinquete, Trofeu Individual Bancaixa, Circuit Bancaixa, raspall singles championship, and raspall team championship. Skiing is a popular sport. In the past, this sport was under development for economic reasons. However the improvement of the economy of Spain, helped skiing become an active sport event. It has become popular, and the skiing sites have been modernized in recent years. In Spain is the southernmost ski resort of Europe, Sierra Nevada. Skiing is one of the favourite sports of the Spanish Royal Family. Spain has enjoyed some success in competitive alpine skiing. Skiers who have won races in the Alpine Skiing World Cup include Carolina Ruiz Castillo, María José Rienda, and siblings Blanca and Francisco Fernández Ochoa. The Fernández Ochoas are the only Spanish athletes to have won medals at the Winter Olympics, with Francisco winning a gold medal in the men's slalom in the 1972 Winter Olympics and Blanca winning a bronze in the women's equivalent twenty years later. ↑ "Garcia aims for Spanish hat-trick". BBC News. 2008-07-15. Retrieved 2014-03-22. ↑ ""¡Fuera del agua, gorda!"" [“Out of the water, fatty!”]. El País (in Spanish). 25 September 2012. Retrieved 21 May 2016. ↑ Torres, Diego (26 January 2013). "Andrea Fuentes se retira de la natación sincronizada" [Andrea Fuentes retires from synchronized swimming]. El País (in Spanish). Retrieved 25 May 2016.